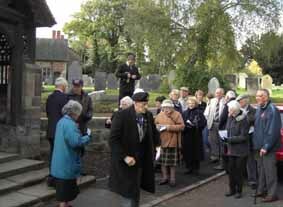 "Winner of the Staffordshire Building Community Life Competition 2006"
Unlike many churches, St Mary's in Rolleston on Dove holds an annual Armistice Day Act of Remembrance on 11th November, as well as a special service on the nearest Sunday. This year, the Act of Remembrance was attended by over sixty people who gathered at the lych gate, including veterans of the Second World War. Passing motorists, cyclists and pedestrians stopped as a mark of respect, and some joined the assembly. After an opening prayer, the Rector, Rev. Ian Whitehead, read the names of those who had fallen in the First World War. The Homage was read by Royal British Legion member George Featherstone. The two minutes' silence was observed at 11 o'clock, after which Ian read the names of those who had fallen in the Second World War. The Kohima Epitaph was read by Alan Cox. The bugler was Michael Marrison. The lych gate is Rolleston's War Memorial. It was designed by a London architect, Cecil G. Hare, and built by Bridgeman of Lichfield at a cost of £310. Part of the woodwork was made from seasoned timber from the Rolleston Estate, a gift from Sir Oswald Mosley, who also gave £50. It was completed by 26th October 1919, and the first anniversary of the Armistice was commemorated there on 11th. November, as was extensively reported in the Burton Mail. One of the Churchwardens, Arnold Burston, is investigating the background of those whose names are recorded there. He would be glad to receive any information from those who knew them or who know of them. The photo shows the crowd beginning to assemble this year. St Mary's Church in Rolleston on Dove hosted a "Marathon" with a difference from 9.30am on Saturday 18th November to 9.30am on Sunday 19th. Ced Morgan on the organ was hoping to play all 1144 songs and hymns from "Complete Mission Praise" within the 24-hour period, and raise money with sponsorship and donations for the St Mary's Fabric Fund to help with the Church's ambitious programme of refurbishment and extension. The first phase of the work, the wheelchair access ramp and the new paths, is already complete, and plans are in hand to improve the steps to the lych gate and to replace the kitchen and improve other facilities at the Old Grammar School. The Trustees are very mindful that the dwellings could benefit from a refurbishment scheme in due course and to this end we have engaged an architect to prepare tentative drawings for later consideration. Any plans will have to preserve the historic appearance and setting as seen from Burnside. The beech trees are growing back across the almshouses roof and taking light from the small windows. We will be making one of our periodic planning applications for controlled lopping of the offending branches. Horses and ponies at the Blue Cross equine rehabilitation centre on Dovecliff Road, Rolleston-on-Dove, were joined by a host of guests to celebrate the grand opening of the new centre on 29th September. 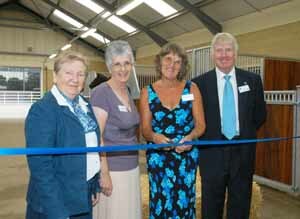 Mrs Brenda Luke and Mrs Susan Brown, great nieces of Robert Archer who bequeathed the land to The Blue Cross in memory of his late wife Hilda, cut the ribbon to officially open the site and spoke about their family’s love of animals and delight at seeing the centre helping so many needy horses and ponies. 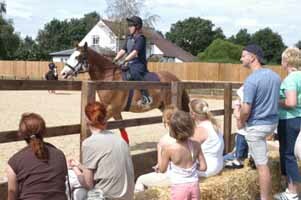 Guests were also present at a riding display where Blue Cross grooms demonstrated how a balance of empathy and training had helped the horses overcome past problems and given them a second chance of a worthwhile, fulfilling future. Anyone who feels they can provide an experienced, long term home for a horse or pony in the charity’s care can contact the Rolleston equine centre on 0845 260 5505, email equine@bluecross.org.uk or visit the website at www.bluecross.org.uk . For further information on The Blue Cross’s Sponsor-A-Pony scheme, visit the website or telephone Callie Rose 01993 825564, email callie.rose@bluecross.org.uk. 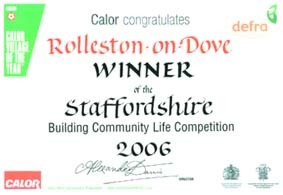 Rolleston-on-Dove is celebrating having been revealed as the winner of the 2006 Calor Staffordshire Building Community Life competition at a presentation event held on Wednesday, September 20, at Weston Methodist Church Hall. Three villages were in line for prizes in the competition, which is being run in every county in England as part of the Calor Village of the Year competition or as a stand alone competition thanks to support from Defra (Department for Environment, Food and Rural Affairs). The villages of Rolleston-on-Dove, Church Eaton and Stonnall were shortlisted from the original entrants and faced visits from the competition judging team during July. The competition was run by the Community Council of Staffordshire and judged villages on various different aspects of their community life, looking for vibrant, inclusive communities that work hard to provide for residents and enhance the quality of life for everyone in the village. Competition judges said: "We were very impressed by the community spirit shown in all three of the villages visited and each one clearly had its strengths and weaknesses. However, Rolleston-on-Dove stood out as having the greatest level of community involvement and thoroughly deserves the county Building Community Life title." As the winner of the competition, representatives of Rolleston were presented with £250 prize money. Runners-up Church Eaton and Stonnall each received £125. Brian Challis, representing Calor, also presented each village with a framed commemorative certificate in recognition of their success. Andy Halden, the Community Council's CEO, said: "Our congratulations go to all three shortlisted villages, but particularly to Rolleston as the winner. It was great to have the opportunity to celebrate with representatives of the villages at the awards event and I would like to take this opportunity to thank them for the hard work they've put into entering the competition in 2006." Rolleston’s Neighbourhood Library on Wheels was officially launched at an Open Day on Thursday 14th September. Unfortunately, despite September’s Indian summer, torrential downpours on the day meant the morning story time on the grass under the gazebo had to be held on board the library instead. However the little children and their carers who came along all enjoyed themselves. The afternoon weather looked no better and some invited dignitaries found themselves cut off by flood water, but around 2pm the sun broke through and the afternoon turned out to be a great success. Around 15 children from John of Rolleston Primary School, accompanied by 3 teachers, braved the weather, all suitably clad in waterproofs, and were entertained on board the vehicle by Gez Walsh, "The Potty Poet", for around 45 minutes. He was brilliant and had them squealing with laughter at his stories and poems. The teachers' funny dance contest went down especially well! John Morris, Parish Councillor, was also in attendance with his hurdy-gurdy box and his ‘monkey’, so there was musical accompaniment throughout the afternoon. At 2.30 Councillor Robert Fraser cut the specially decorated cake along with one of the children from the school and declared the library officially open. Slices of cake were handed round by the children and enjoyed by local councillors and library customers. Staffordshire Library Service would like to say thank you to everyone who attended and contributed to making the day such a happy event. Don’t forget the library is parked on Rolleston Club car park every Thursday from 9.30am – 7.30pm. It has around 4,000 books, talking books and DVDs available for loan and membership is free for all ages. 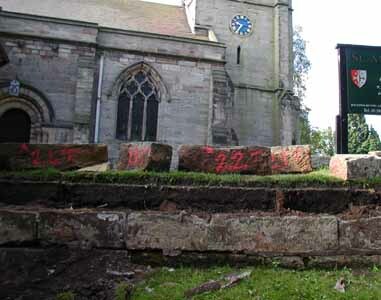 On Monday 7th August work began on the access ramp at St Mary's Church. Further details about this, and the modernisation programme, can be found here. After a long and painful planning process a new, larger village notice board has been erected outside Starbuck’s. The three section board has been funded jointly by the Parish council and a number of village organisations. One third will be reserved for Parish Council business and the other two thirds for general village use. Generous donations from RODSEC, Civic Trust, Rolleston W I, Doveside W I, Choral Society, Cricket Club, Scout Group, Allotment Society, FOJORPS and Conservative Assn, have allowed the board to be made. The Parish Council notice board at the Spread Eagle will continue to be used for the village map. A planning application has been made for a further notice board for Parish Council business in the jitty beside the Westbury Homes Development. Best Rear Garden, more than 100 sq m.
Local animal lovers made some four-legged friends on Saturday 29 July when The Blue Cross equine rehabilitation centre in Rolleston-on-Dove opened its doors for a preview open day. The centre will open its doors to the public on 19 August, with an official opening due to take place later in September. 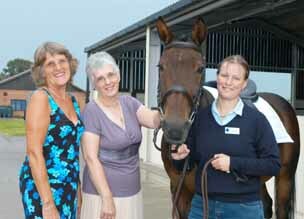 For further information about the new Blue Cross equine rehabilitation in Rolleston, the charity’s sponsor a pony scheme or how to get involved with the charity’s work across the UK visit www.bluecross.org.uk or call the centre on 0845 2605505. On 23 July large crowds, on a wonderful sunny afternoon, had the opportunity to look round 14 gardens and also a model of Ilkeston Station and its sidings around the year 1906 (in the Old Grammar School), raising £2,700 (now £2,900, thanks to a generous donation), for the Fabric Fund. Next year Gardens Sunday will be on 17 June. Please consider whether you could allow others to share your garden on that date. Scenes from one of the front gardens that attracts interest throughout the year are pictured above. 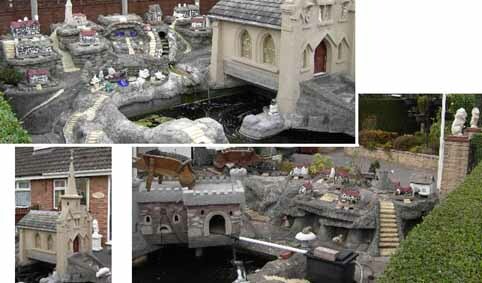 Rolleston has made it to the final three in the Calor Village of the Year competition. Judges came on Thursday 13 July for two hours to look around the village. An Organ Recital was given by Dr. Francis Jackson OBE, at St. Johns Church, Horninglow on 4 July. Francis played the first concert of the first Rolleston Festival 40 years ago, and returned in 1968 for a further concert. He was President of the Rolleston Music Circle & Choral Society for the term 1973-74 and is a Life Member of the Society. As well as the usual activities, the whole of Rolleston was treated to a RAF Battle of Britain memorial flypast with first the Dakota passing low over the school several times, and then the spitfire and hurricane together doing the same shortly afterwards. Following her very successful appearances as "Mary, Queen of Scots" and "Gloriana", Lesley Smith of Tutbury Castle appeared as "Nell Gwyn" before a large audience in Rolleston Club on Sunday 19 March. The event was the last one to be organised, shortly before her death, by the late Ann Burston, who had been the Chairman of the Rolleston on Dove Special Events Committee (RODSEC) since its inception in 2000. As well as being a superb performer who establishes an immediate rapport with her audience, Lesley is a serious historian whose research is thorough and painstaking. Her performances are characterised by a lively wit and an endless fund of amusing and interesting anecdotes. At the end of the show, she announced that she intends to plant a red rose at the Castle in memory of Ann Burston. 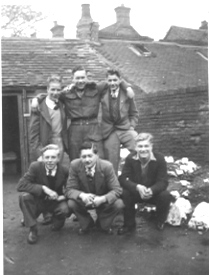 The evening continued with a buffet put on by Beryl Toon, followed by the famous RODSEC home-made puddings prepared by Verity Conner and her friends. The next RODSEC event will be a concert by the Mellstock Band in St. Mary's Church in November, and the Committee are already planning a "Heritage Weekend" to be held in the village next year. The picture shows Lesley with new RODSEC Chairman, Arnold Burston. "Doreen is a much loved and valued member of the Oncology team. Not only does she serve tea and coffee to patients and relatives waiting for and receiving treatment, she reassures those who are frightened and worried with her kind and thoughtful manner. She is the epitome of politeness, and always conducts herself professionally. Both staff and patients appreciate what she does, and she is missed when she is not around. Not only is she a dedicated volunteer for Oncology, but she has also raised hundreds of pounds over the years for Macmillan Cancer relief and also Burton Cancer Patient Fund." The Oncology Unit in Burton Queen's Hospital is a model for others to follow. It immediately strikes one as a comfortable, friendly and spotlessly clean area, where the receptionists, nursing staff and volunteers are unfailingly helpful, courteous and anxious to put patients and their families at their ease. The final touch in the creation of a homely, family atmosphere is added by Doreen's cup of tea and friendly smile. The Club has been owned by the Trustees on behalf of its Members since 1933 and has been a success, year on year, as can be judged by the waiting list; sometimes it has been ten years before one was invited to join. However, modern society abhors a risk, and insurance can only be obtained with the most comprehensive control of all matters relating to the pool, maintenance of premises and full supervision of the Members. This requires an organisation and budget well beyond the scope of a members-only club, for an open-air season lasting only some five months of the year. After investigation of the possibilities by members of the Committee and by a dedicated sub-committee, no viable solution was found which would enable the Club to run a pool at the site. All income ceased since closure in 2003 and the reserves have fallen dramatically. No persons or organisations have come forward to offer a practical solution which would ensure the safety/security of what is a quite isolated site. Drug abuse and vandalism being not unknown in this area. The decision to sell was therefore taken and planning permission applied for to change the site to one domestic dwelling by conversion of the tower. This necessitated the clearance of some scrub and undergrowth but NO mature trees are involved. There is a blanket preservation order on all mature trees, so no redwoods will be felled. This minimum development of the site will ensure its protection from the dereliction that would occur with an open access area, which some people think would be preferable. They fail to recognise what would occur should this become an open space with no supervision in place. It is with regret that closure has become inevitable, but such is our modern nanny state, no other course of action could be seen to be in the interest of our members. Therefore the sale of the property on behalf of its members is to be by public auction open to all individuals or organisations. We trust that the final owners of the property will make the best use of this attractive site preserving the natural beauty of the mature trees and an unusual building. The site was auctioned off on 1st March 2006 and sold for £375,000. 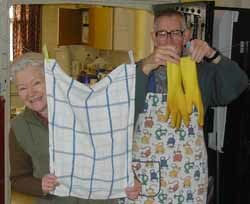 Anthea and Duncan Topliss have finally hung up their gloves (rubber, not boxing) after running Rolleston's weekly coffee morning for over ten years. With the help of a friend, Ken Alderson, they have served coffee and biscuits, and of course washed up, 51 weeks in the year. The coffee morning is attended by between forty and fifty people who each year contribute about £1,200 to church funds. Some of the money is spent on the upkeep of the churchyard and the rest goes to the Fabric Fund for St. Mary's Church's ambitious programme of restoration, enlargement and improvements in wheelchair access. The weekly event also provides an extra social centre for the village, and is useful for bringing members of the community together and disseminating local information. To mark the occasion, Janet Neal had made and decorated a large cake. Anthea was presented with a magnificent bouquet of fresh flowers and Duncan received a large crystal bowl (and a new pair of yellow gloves). Fortunately, they will be replaced by a rota (of more than 20 people! ), and the coffee mornings will continue to be held every Thursday from 9.30 to 11.30 in the Old Grammar School in the churchyard of St. Mary's.